The Dinosaur Train is filled with its most fascinating passengers yet as it makes new and exciting stops in DINOSAUR TRAIN: DINOSAURS A TO Z. Join Buddy and his family as they embark on a musical tour where they learn about fantastic dinosaur species that Buddy never knew existed. From the singing Corythosaurus to the speedy Ornithomimus, this is one train no one will want to miss! 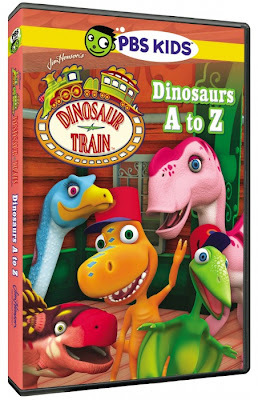 From the world-renowned Jim Henson Company, PBS KIDS and Paramount Home Media Distribution, the DINOSAUR TRAIN: DINOSAURS A TO Z DVD features nine exciting dino-filled adventures including a bonus holiday episode titled “Solstice Time” and loads of special features including Dr. Scott video segments, interactive games, coloring pages, information for parents and more. We absolutely love Dinosaur Train in our household. Not only does this include two of my son's favorite things, trains and dinosaurs, but I absolutely love this show because it also teaches my kids about dinosaurs and not just your average way of learning. This show makes it fun with memorable songs and fun and exciting adventures and this latest edition, Dinosaurs A to Z was no different. My son was glued to the television the entire time this was on, this show even caught the eye of my seven year old daughter. She loves anything to do with music, so she was all over this and remembered the songs so well as my kids watched this a few times in a row. If your kids are a fan of this show or are a fan of dinosaurs, trains or catchy music tunes, this is definitely something you should have in your collection. Released October 2nd, this latest edition of Dinosaur Train is now out for your family to own. Disclosure: All opinions are my own. I received Dinosaur Train: Dinosaurs A to z at no cost for the purpose of this review. No other compensation was received.